I just finished reading this book. It is a book explaining pivotal events, people and achievements of world history. The history of the world, or the human world, or the civilized human world covers a relatively short period of time compared with the history of earth. It is closely related to religion, arts and literature, philosophy, governance and particularly war. Modern culture and science and technology as we know them occurred only in the last two hundred years. The book starts off with the wisdom of the ancients, including those in Egypt, India, China, Mesopotamia, Aztec and Inca. It also traces the origin of religion from human sacrifice to Judaism, Christianity, Islam and Buddhism. I think many of us studied these subjects in our academic life. 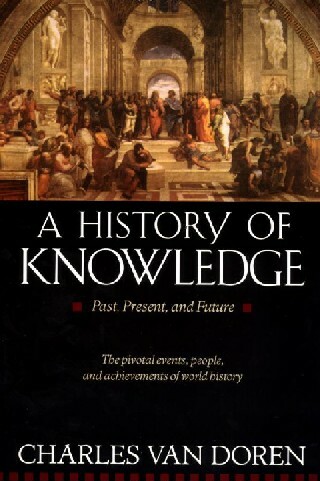 There is no new knowledge coming out of this concise history book of knowledge. Furthermore, I note that the author mainly focuses on the development of western civilization. It is a narrow view as far as the knowledge of the world is concerned. Although it may be said that the western civilization has dominated the world in the last few centuries, mainly on modern government and science, there are much valuable knowledge in the East which should be worth mentioning. Notwithstanding that, the author does cleverly summarize all the major events and personalities in western history; and along the way, he also gives some insight to the contribution of the knowledge to civilization along many centuries. I find reading the book satisfying. It is like a revision of the development of human civilization over 5000 years. It is also like a bowl of instant noodle which can fill your stomach in three minutes without much effort, because the essence is condensed to an easily manageable proportion. Besides that, the book is a useful reference material which comes in handy when I want to refer to some particularly important incidents in western history. Not much more can be said about history of knowledge better than that expressed by the author, and I do not intend to copy and paste his passages. However, besides things of the past, one interesting part of the book is the development of knowledge in the next hundred years. No one can predict the future. Thus the commentaries on the advancement of knowledge in the next hundred years are pure speculation, sometimes bordering on sci-fi fantasies, but fantasies based on known facts at present. The book was written in 1991, some seventeen years ago. At that time, there were still ten more years before the commencement of the 21th century. Looking back today, there are hints on which parts of the predictions are turning into reality. Predictions on future world governance hinge on modern war equipment of nuclear weapons. When the cold war ended in the last decade of the 20th century, the fear of a nuclear war did not go away. More nations have now developed their own nuclear weapons, which are also available to some non-nuclear weapon countries and terrorists. The author predicts that the checks and balances for world peace on the total destruction force of nuclear weapons may lead to a world government. Development in the last seventeen years has not been optimistic. Rather than moving towards a world government, perhaps in the form of an United States of Earth, there have been developments towards regional powers. Among the chaotic world of powers, there emerge several attractors leading to cartels in Europe, North America, Asia and Africa. When vying for limited natural resources, there are conflicting interests among the cartels. We may need a catastrophic event before the human race may eventually unite to deal with a common problem. The development of computer technology was already quite advanced in 1991. There have been predictions that computers would evolve into thinking machines communicating through worldwide networks. There are also consensus views in the science community that the computer would attain singularity (self-consciousness) within 30 years. We now see the Internet growing at an exponential rate and it now possesses almost all the knowledge of the world. Computer networks occupy most of the space of our daily life. They are still short of a self-conscious mind, but all the evidents are pointing to such an event in the not too distant future. The author predicts that it will happen within the next hundred years while many scientists say it would be much sooner. Eugenics has been a philosophical subject for many thousands of years, all the way back to Plato who theorized that slaves were inferior by nature and the aristocrats were better persons. Humans have been enthusiastic in improving species by breeding, both for animals and plants as well as among humans. There are many examples of attempts to improve the quality of mankind by scientists, sociologists and politicians. Adolf Hitler comes to mind, and also many governments which advocate marriage between nobles as well as university graduates. We know quite well today that such attempts are immoral as all men are created equal and have the same rights. However, the rapid development of genetic engineering and computer-assisted implant organs have given a new meaning to eugenics. Such technologies were still at their infancy in 1991, but there have been bold and sensible predictions that such technological improvements will really improve the quality of human being, that some humans will be superior in mind power, physical power and longevity. Sadly these intricate and expensive improvements will only be available to the privileged few of the riches and learned groups of the society, with such better traits of human qualities passed on to their descendants. Thus born an elite race, or sub-species, of human being. Democracy is built on human rights and the premises that all men are equal. However, all democratic governments nowadays are still not entirely satisfactory. Voters are misled and many ruling parties do not wholeheartedly serve the interest of the majority. As a form of government, democracy has seldom proved popular among the most powerful citizens. The most serious threat to democracy comes not from the totalitarianism of left and right, but from oligarchy which is the rule of the few who claim to be the best over the many. With the development of a more superior breed of human being, it is predicted that such danger will increasingly become real in the next hundred years. However, since the book was written, we still have not seen such drastic development. It is partly the result of the ban of some governments on genetic engineering and stem cell research for the time being.